I am so looking forward to being able to play a version of this game, the artwork is truely fabulous and I am a big jrpg fan. What platforms are you planning to release on? 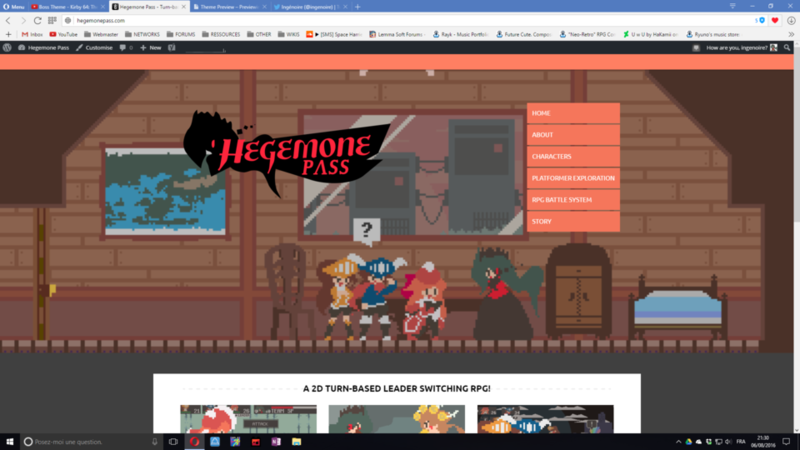 The Hegemone Pass website is now online! It is still a work in progress, and the site is subject to changing. It's still a very early website. It was built thanks to Wordpress. We will also be posting the contents of the devlog onto the website. The website will be crucial for the press release, but it can't be used on it's own: we will need to make an announcement trailer, but that is going to take some time, and there are certain things I need to get done with the game before showcasing it in a trailer. 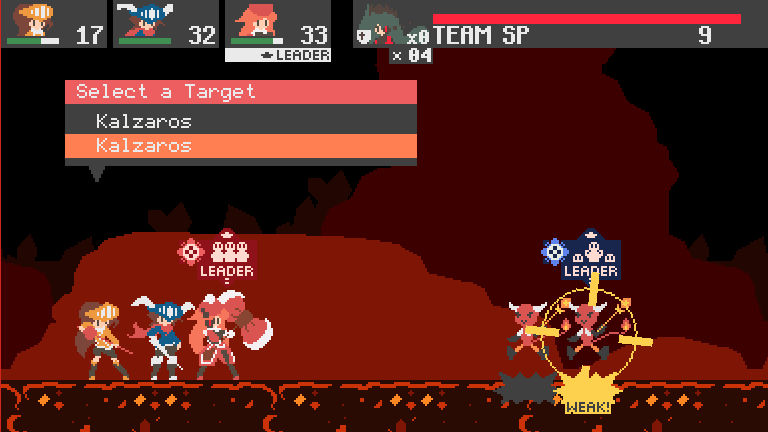 Most notably, a bug with the positioning of special effects during the battle system, which causes it to have a slight 1 frame delay from intended. In the future, the top part of the website will contain a short description of the game, and act as the portal for the details of the game itself (like mecanics, story and characters), while the bottom will remain as the devlog, alongside announcements of all sorts. The trailer and some screenshots would also be accessible straight from the top of the page. This small zone will dedicate responses to the Devlog and the game. If there is any feedback you want to give, I’ll try to respond here. However if I don’t respond, generally I’ve acknowledged it, but don’t have any answer at the current time. [HappinessSam] : "I am so looking forward to being able to play a version of this game, the artwork is truly fabulous and I am a big jrpg fan. What platforms are you planning to release on?" -> Currently, we plan on releasing the game for PC. Hopefully, we will be also porting it to certain consoles in the future, but the original release on PC goes first. If there are no issues, it should release on Windows, Mac and Linux easily. Development of the game will be resuming shortly! We have another devlog post planned for next week, so please stay tuned! 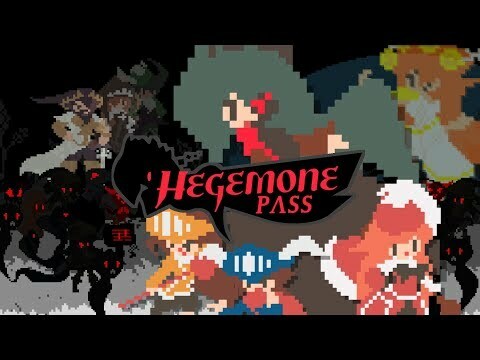 This week’s update will talk about how you get new titles in Hegemone Pass! It will be essential, so pay attention! First, a quick recap about titles. 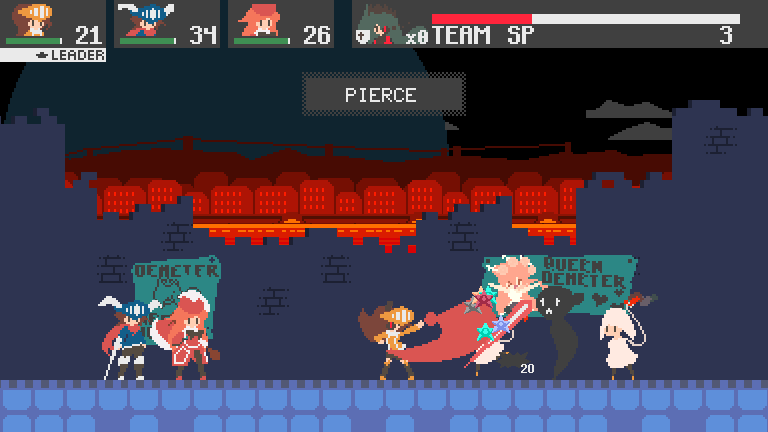 A title acts as an equipment for each character. The title’s powers take effect once the owner of that title becomes the leader in battle. All your allies and foes have one equipped. A title can affect different targets based on its type: Team affects positively your team, Leader greatly affects positively your leader, Fear affects negatively the enemy team, and Target greatly affects negatively the enemy leader. A title can improve stats, add resistances, and a beneficial special effect. It can also weaken stats, add weaknesses, and have a negative special effect. It’s based on the type of title, generally. Fear and Target titles cannot affect resistances. By switching your leader, the old leader’s title is not in effect any more, and the new leader’s title comes into effect. 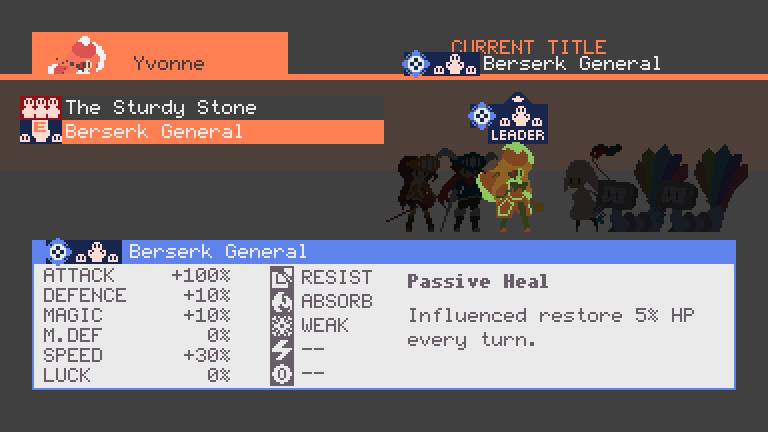 You can improve your battle strategy by equipping titles that go well with your other party members. But how do you get new titles? In normal circumstances, a title is granted to you by gods, demigods, heroes, or an entire population for having done a recognizable act that lives on with the soul. Everyone has at least one title, no matter how basic it is. Yvonne, Ethan and Emilie, like most of the young and inexperienced, only have a basic title given to them based on the position in their tribe. With Demeter ruling the Underworld, the rules that applied under the reign of Persephone no longer apply. As a result, stealing titles has become a common occurrence in the Underworld. Persephone, having her own title stolen by Demeter, can recognize stolen titles easily. Stolen titles don’t belong to the owner. They are physically represented by a dark butterfly. Normal titles are physically represented by coloured butterflies, with the colour it bears reflecting the title’s type (Red – Team, Blue – Leader, Green – Fear, Purple – Target). In order to get new titles, you must find an enemy carrying a stolen title, and defeat the enemy while they are the leader of their team! It is relatively simple. 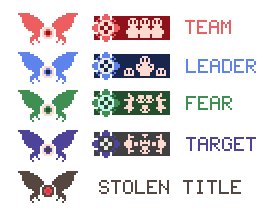 Once you defeat the leader, the stolen title’s colour will be restored. And Persephone will give the title to the one best suited for it, who will be the only one who can equip it. You can equip it right away if you wish, but you can change your equipped title at any time in the main menu. If you defeat a foe with a stolen title, but they were not the leader, don’t worry! 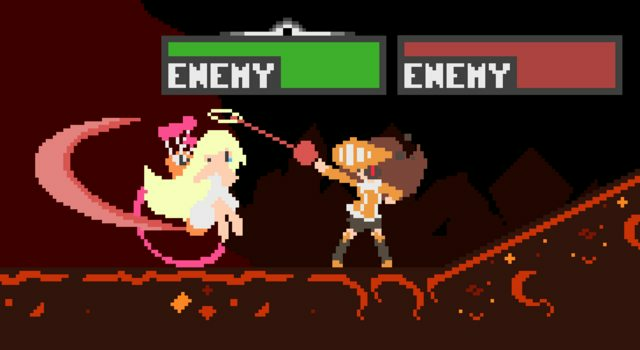 For every enemy of the same type you defeat, the odds of encountering the enemy with the stolen title increases! With a bit of persistence, you will be able to retrieve a stolen title without to much effort! And that’s about it for this week! Next week’s update will be a small one. I am now hard at work on getting the game ready for an announcement trailer and a press release! Today's update is not going to be major. I have been hard at work on making the first chapter of the game, but it is nowhere near close to being done. So, today I'm going to just showcase what exactly I have done this past week. This week, I was mostly making the level design of the first chapter, but I did significant updates to the tile sets of both areas used inside of chapter 1. First of all, we updated the background for the city levels. 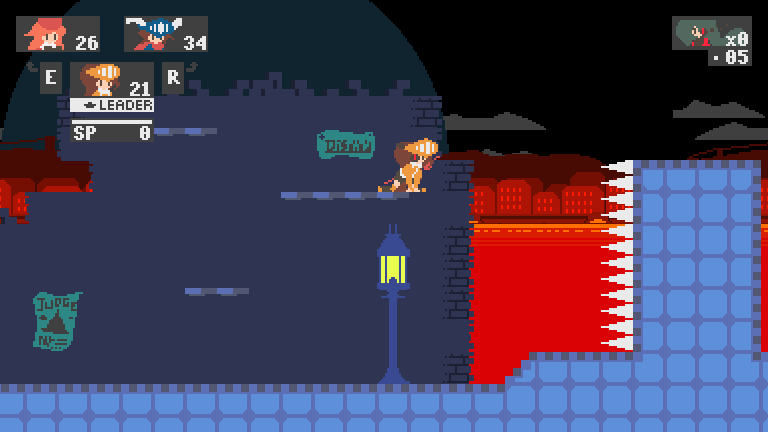 The lava has been simplified, and the city in the background has much more red than before, making the city reflect more it's status as a capital city of the Underworld. It's a lively place to be in. In contrast to the background, the ground and walls are blue and cold, as it's just outside of the city. It's still part of the city, but it's merely the suburbs. Posters of Demeter are all over the walls, as well as Wanted Posters for Persephone. There are different posters in the city too! Here's a showcase of a new entity in the game! A breakable rock! Yvonne can break these rocks using her Ribbon Axe. During the later parts of the Chapter 1, you'll be venturing farther outside from the city. It's what most people think of when they think of the Underworld! The uninteresting areas of the Underworld look like this. It's kind of like the countryside, but a lot more sour. By the way, those spikes will deal great damage to the current leader. Luckily, you cannot be KO'ed on the field! 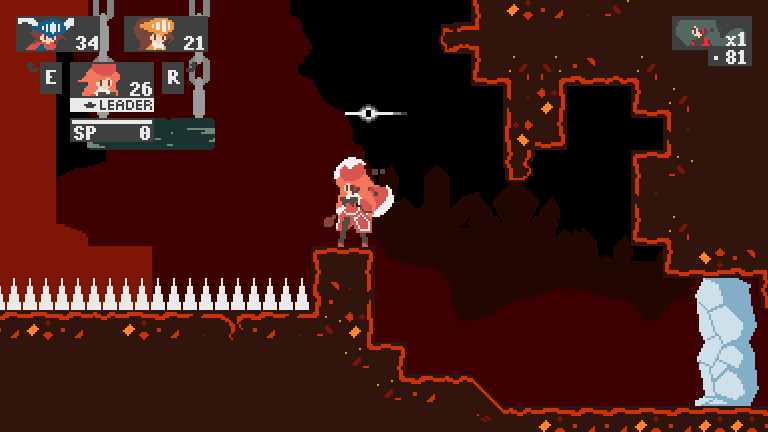 I haven't shown it here, but the majority of the Underworld's "countryside" has lava, and I did update the design of the lava. And that's all for this week! I'll be working hard to make as much progress on Chapter 1 as possible. It's going to be the main area I use to create the announcement trailer. It's a very small update this week, as most of the week went into doing content planning for the game's first chapter. 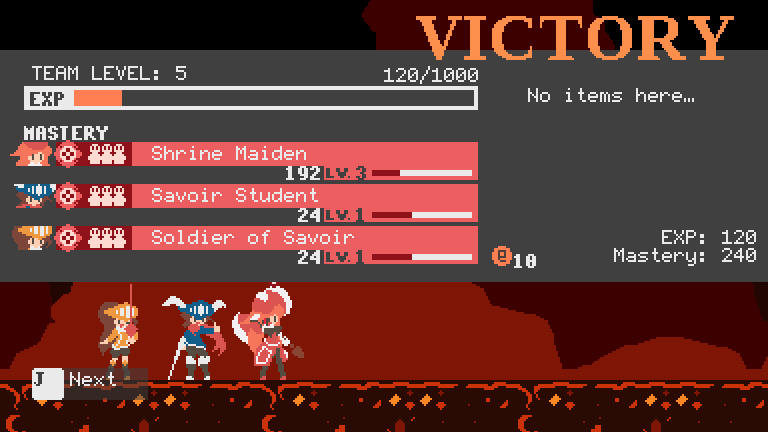 Not much visually was done, except for updating and optimizing the title equip screen in the pause menu. 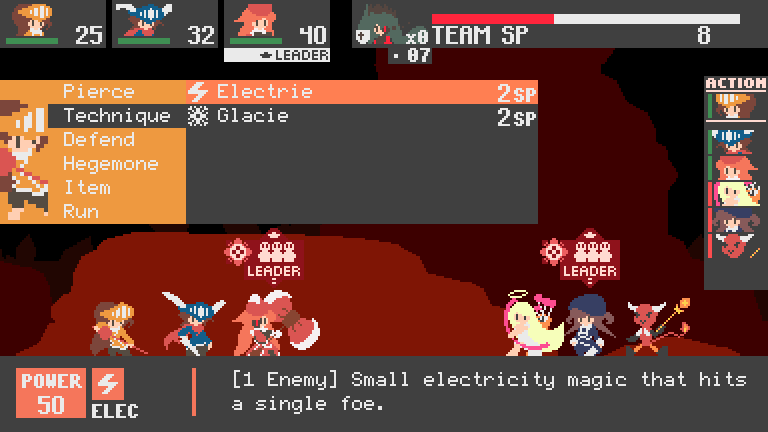 The screen highlights who gets affected by the selected title when equipped by the party member when they are the leader. The update to this screen was done because it was poorly optimized. And a little debug screenshot, since I'm a bit short of stuff to show this week: rising water! Each character has special tweaks when under water. When Ethan is under water, his bunny glide will lose altitude much, much slower than usual, allowing you to cross very large gaps. 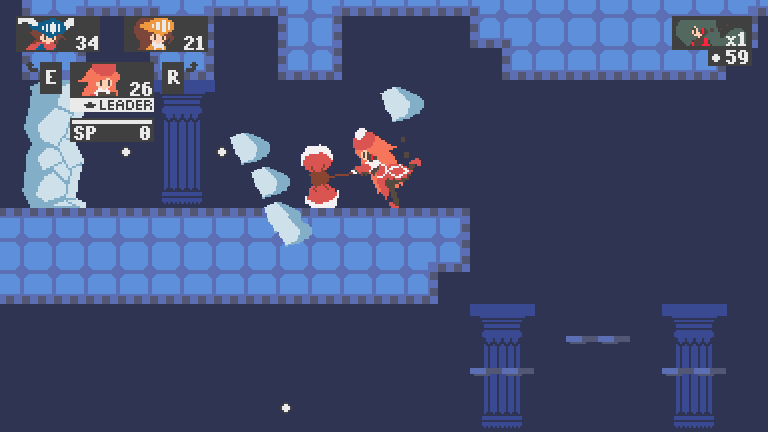 With rising water, there can be puzzles where the player would need to wait for the water to be sufficiently high to cross a large distance, being impossible to perform outside of the water. Whoops! I completely forgot the past two weeks to update the devlog on here! I'm too exhausted from the past few days of work outside, so I'll be giving a quick summary of both updates, both which can be found on the main website. 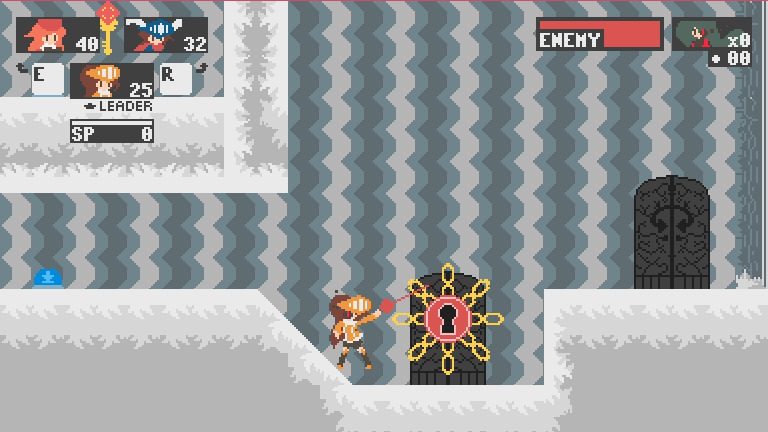 In this post, I write about a new friendly, non-playable character, Memo. He's the god of memory, and can help you with a shop, a save feature and more! The more recent post, talking about a new obstacle, the Leader Lock Zone! It forces your leader to switch to the color of the designated leader lock zone, and prevents you from switching your leader while inside! Hopefully, I'll remember next time to post it here. There was an unexpected Siliconera article that popped up! I did not send any Press Release, FYI. It's nice that an article has been written! However, I must work on a Press Release ASAP, alongside a trailer, so that journalists have a clear idea about what the game is about and help them write about the game more easily. The game appearing in a larger space other than game dev forums / twitter does require me to take more caution with what I release (I don't want unfinished material passing off as finished, for example)... The Press Release will be an attempt to showcase the gameplay and the special properties of the leader switching and titles mechanic through the trailer, with the text being reviewed to make sure I can get the message accross clearly. One idea is a Super Smash Bros % Ejection Comparaison shot-like scene in the trailer for showcasing the effects of the different titles. This means I got to work on my writing, making sure I can convey the necessary information clearly. The website will also be updated with the new PR. Certain small details have changed, and certain screenshots have outdated tiles or UI elements. This is a very sudden update. This whole week I'm working full time at work (not much rest), but from next week I'll be able to resume regular work on the game. Updates are going to slow down: the press release material is going to take the highest priority (it was already high enough, but the article does push the urgency of doing it). This is also going to force me to decide on the music composer, and if possible, the promotional artist. TL;DR: Siliconera posted about our game! Since I did not send a Press Release, but it's out there on a big site, the top priority is to get a Press Release and trailer written, to clear any confusion and help out the writters when writing about the game. Currently, I've been working on a lot of different things, but all towards one goal: to get a trailer/press release done. One good thing is that the Database Editor is useable, and I can create content much easier than before. 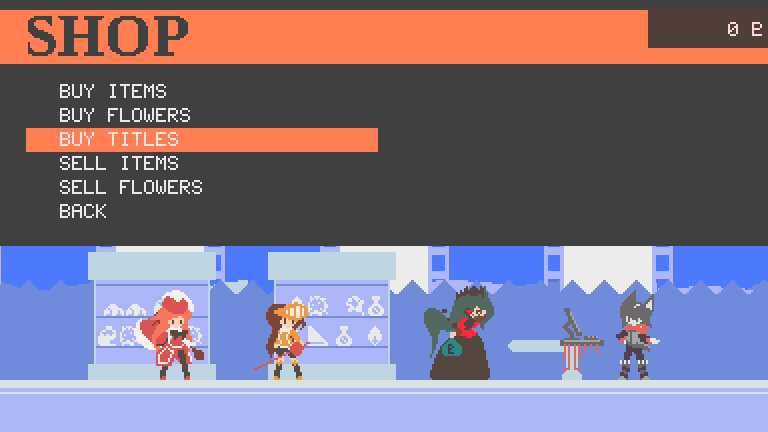 There are still a few things to iron out, but the game takes the data correctly now. There are other things I did, but a lot of it is mostly backend. A few things, like field damage counters, are shown in my latest post on the website. Hopefully, I'm expecting to get the all this done near end November. Hopefully. I also need to decide on a composer, as the trailer will require music. Long time no see! I've posted a new blog post today! To summarize, the game is now entering content development. First of all, I am terribly sorry for not having posted anything formal on the devlog. I had a two month period where I had a lot of real-life work to do, and the rest of the time during this silence was doing a lot of backend, such as bug fixing, and optimization here and there. 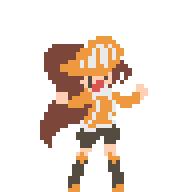 Most importantly, I've also completed during that time both an attack choreography editor (battle animations) and a cut-scene editor, to speed up their creation. Amongst the new changes, I've redone how intermissions works: they now act like a mini hub stage! You can talk with your allies here and access all the features of the intermission. 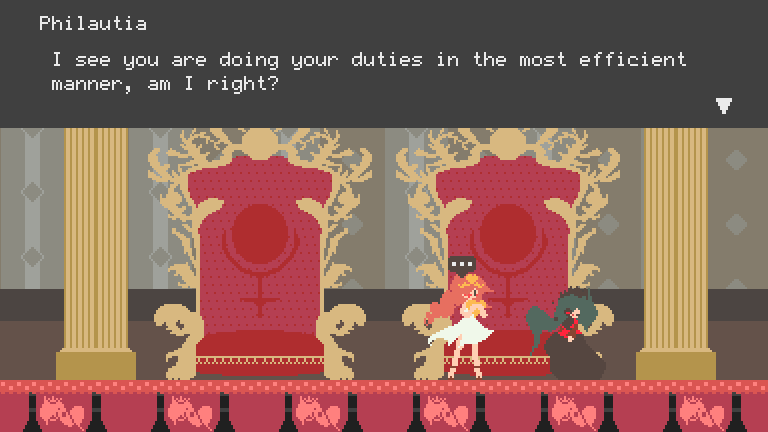 You also get to play as Persephone, not within one of your party members, during Intermission. A few services in Intermission also got a bit of a rework, such as the Mission Select! 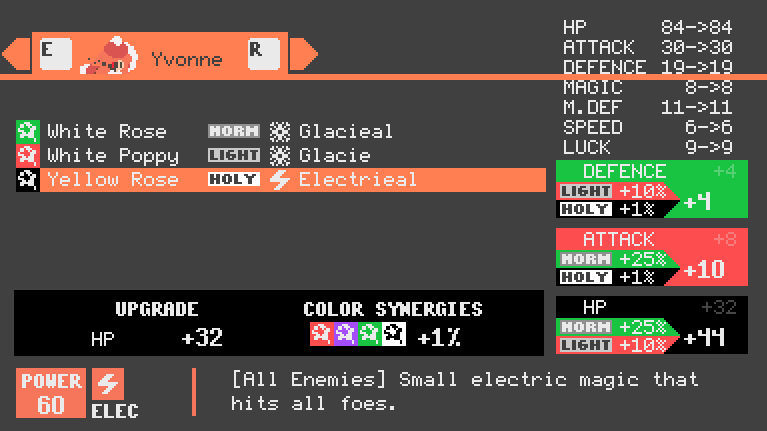 Other things were added, like a stat/buff/debuff viewer during battle. And a few field gimmicks, like the Gravity Minotaur Beam. Again, sorry for the silence. 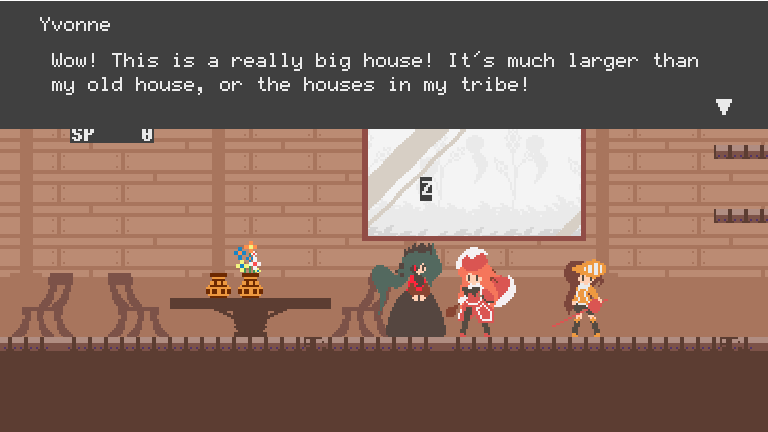 The other changes are listed on the blog, but now I'm on track to create the contents of the game. The enemy radar was recently introduced to warn players in advance when enemies are going to spawn. Also recently introduced, the Lightshine item! Used on field, it closes all portals and scares away all foes for a few steps, resetting the radar along the way! 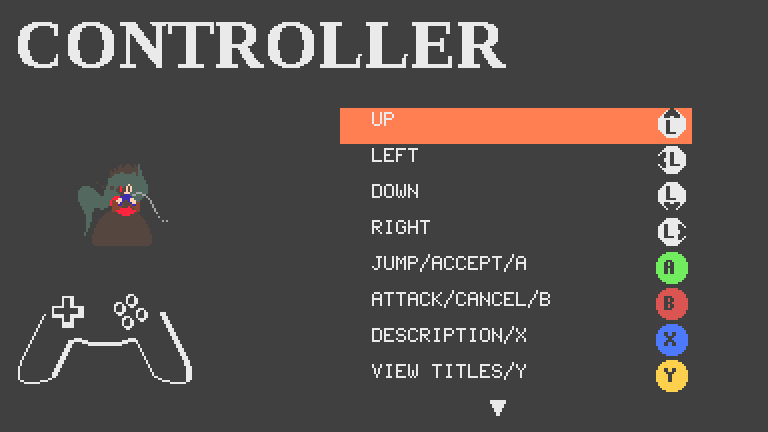 I also created button icons for keyboard and joypad buttons, fixing the keybind screen along the way, and making it so that changes are only applied if you select the apply button. The last change I wanted to point out was that the game now shows when selecting a target if they are weak against the selected attack during battle! It will be very useful for battle where the enemy can switch between multiple leaders carrying team or leader titles that grant resistances or weaknesses. I do post a lot more often (sometimes minor things) on Twitter, but I just wanted to post a few things that I pushed on twitter lately. 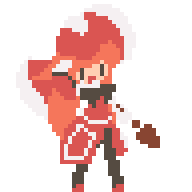 If a lot of small minor updates occur on twitter, I'll probably do small compilation posts here from time to time. Hello! Another post has just been posted to the main blog! 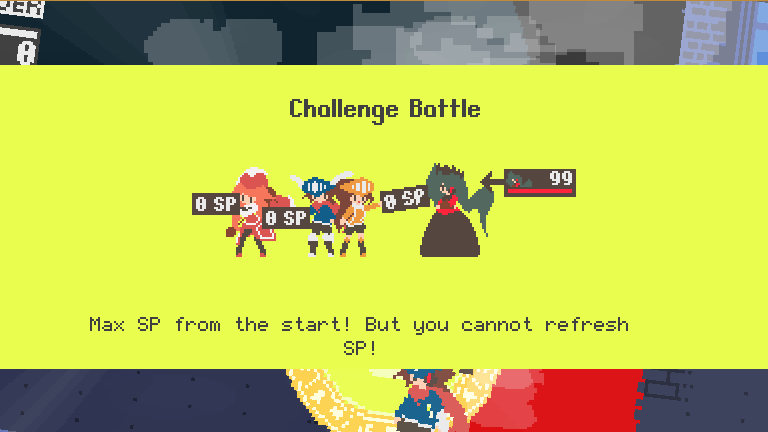 Challenge Battles have been implemented! Find a Challenge Gate, enter it and fight a battle with special conditions to earn special prizes that will be useful for your journey! Losing a challenge does not result in a game over, and can be instantly retried if failed. There are locked doors and the key system that was in the game as a mission objective has now been changed to act like normal keys! Keys only exist within a mission, and don't take any inventory space. Lastly, new animation for obtaining a Persephone power. Wow, it's been a really long time since I last posted on the devlog! I even forgot to post the last update that was in June! I've introduced the mastery system to titles, and I did a bit of UI changes in battle. So what's mastery? Basically, it's a sort of EXP for titles. After every battle, your team gains not only EXP, but mastery points as well. LEVEL 2 Mastery: Improves the buffs/debuffs for the title. LEVEL 3 Mastery: Immediately restores 1 SP when the owner of this title becomes the current leader. FULL Mastery: Exclusive technique usable when the owner of the title has it equipped. When a title is fully mastered, the owner of the title now gets a rank up! Each party member now has a rank. 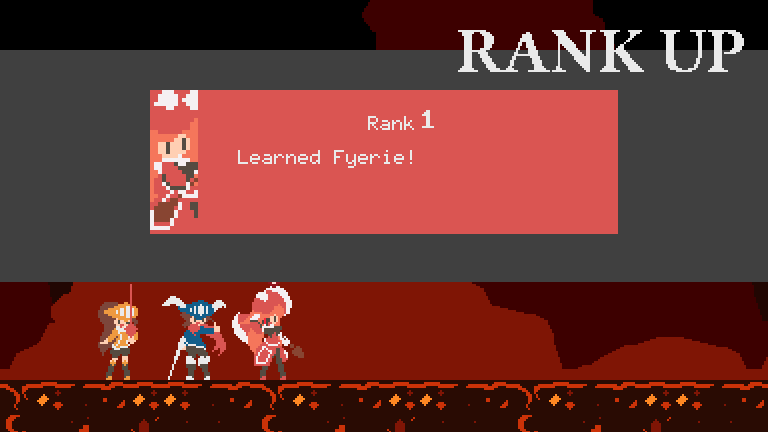 You improve their rank by mastering titles for each character. 1 Point of SP Refresh, the amount of SP restored every time the character's turn comes up in battle. Previously, the game was a very traditional turn based rpg, where you could select each party member's moves before the turn began, and every actor on the field would act based on their speed. Now, it's been changed to something more like Persona, where you only decide their action when it's their turn. It's more useful for the leader switching mechanic, both for the player and the AI, also it let's the AI be more reactive to changing situations with relatively little changes to the AI code. All the stuff mentioned on top is a quick summary of the website's post, here. This is the subject of yesterday's post on the website. I wanted to make the flower equipments a bit more interesting, and easier to make content wise. The old system of creating each flower, with each one having unique stats and a technique, was rather tedious. Essentially, there is a synergy system between the three flowers you can equip for each character, and the way they synergize is based on their colour. Synergizing improves the power of the equipped flowers, but their power is based on their brightness. A bright flower has great power, but poorly improves the other flowers, while a dark flower has poor power, but greatly improves the other flowers. I go into a bit more detail on the flowers and synergy here. Some good news, and recent news too! 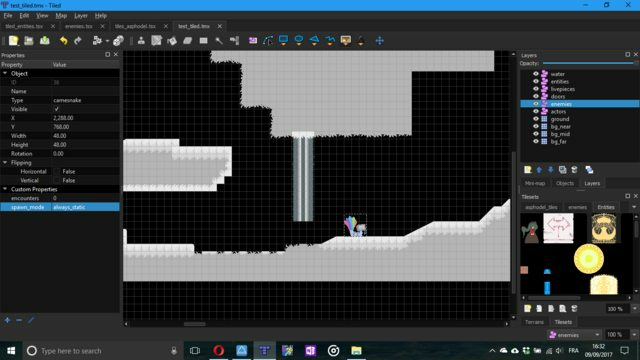 I've changed the level editor from OGMO to Tiled, and it is going to make my life much easier making maps! The amount of lag there was in OGMO for any map larger than a house was horrendous! Tiled has it's minor problems, but definately much more usable than OGMO. The biggest thing I miss from ogmo is the enum variable, absent from tiled, but I just preformat my entities with defined strings as "value1|value2|value3...", and modify the property when I place one in the map. I'm still working on the game, I just had some personal problems. See you soon! Anyway, the main points are describes in the latest post on the website: check here. But down here is a quick summary of the last few changes to the core gameplay. I am actively developing content now. 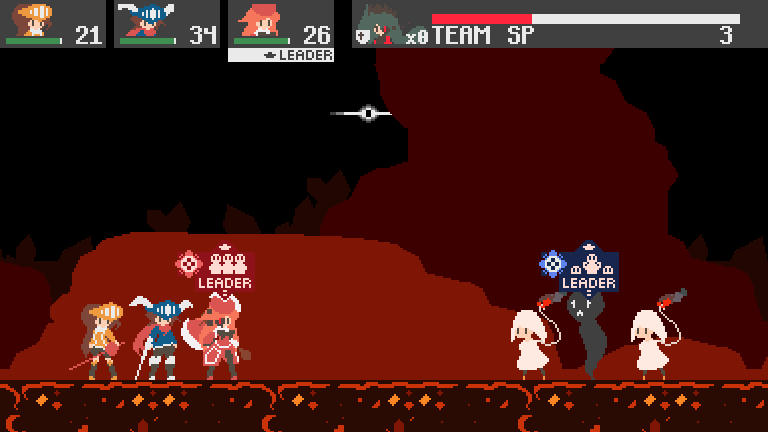 Newer Timeline System: In battle, your action now comes in when the character reaches the end of the timeline. Your speed determines how fast you zoom across the timeline. Faster characters can sometimes go in front of other characters, and even perform two actions before a slower one can act! Also, since the speed stat can be modified by titles, you can also improve your speed or cripple the speed of your foes. Additive Titles, Additive Flowers, Small Stat Numbers: It helps improve balancing. Now titles aren't giving % boosts, but rather, + boosts. Since the stats are way smaller, each extra point matters more now than ever. Faster & Free Hegemone Pass Action: The power to switch leaders in battle has been improved for your team, as you can switch leaders at any time you act, without it wasting the turn! (Animation would need to be improved, btw, to use the old attack version of the HP). I'm back on track. 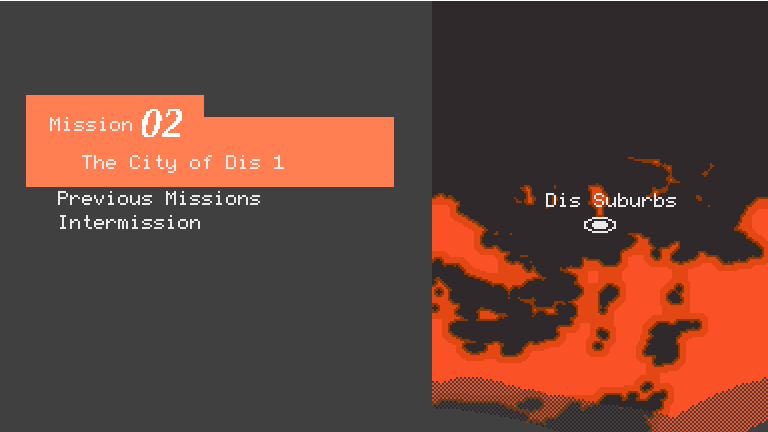 So far, I have the level design prototypes of about 9 missions (about 1/3rd of the main missions). I've been in the Underworld for another stretch of time... and I have returned with the game's first trailer! Click on the picture to watch the trailer! This is also alongside the website's new coat of paint and a press kit! Finally, there is going to be a small early bird test of the game's first demo, which will feature two missions, just to get some early feedback. You can register for this feedback demo here. With this "official" announcement done, hopefully I can go back and finish the game in peace!